words alone must capture and captivate the audience. Doig's novel is like one of those films. His words engage, entertain and satisfy; no cheap stunts are needed to carry the story along. The novel opens with 61-year-old Paul Milliron pondering an unpleasant task: as superintendent of schools, he must inform residents of rural Montana that their country schools are closing. A product of just the sort of school he's been ordered to dismantle, Paul is dismayed by the job he must do. To ward off his despair, he lets his mind wander back to his own school days in Marias Coulee, Montana. His memory takes him back to one banner year: 1909. That was the year his widower father answered an ad for a housekeeper which boldly proclaimed, "Doesn't cook but doesn't bite." Neither Paul nor his two younger brothers know what to expect, but they are shocked when stylish Rose Llewellyn steps off the train accompanied by her equally elegant brother, Morrie. Before the Millirons know it, the pair have firmly ensconsed themselves in prairie life. Rose puts the bachelor farmhouse in order, while Morrie brings his fancy Chicago education to the local one-room schoolhouse. Under Morrie's tutelage, Paul's passion for learning ignites, but not all of his experiences will be in the classroom. As the school year unfolds, Paul experiences death and terror and heartache and wonder. Most of all, he discovers that things are rarely what they seem, not even a kindly housekeeper and her dandy of a brother. 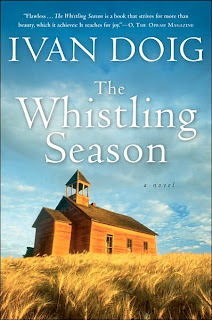 Although it does have a little mystery, The Whistling Season is no edge-of-your-seat thriller. It's a meandering, lyrical tale that won't be rushed. The pleasure is really in the journey, as Doig's every word is poetic and masterful. His characters are real and endearing, as charming as they are sympathetic. Their stories are told with a warmth and humor that enchants and affirms. Simply put, the novel is a masterpiece of old-fashioned storytelling. There were a few things that bugged me about the book. Although I loved Doig's gentle style, I found it lacked focus at certain points. When Rose and Oliver met, I had the story pegged as a romance, but it really wasn't. The spotlight oscillates from the pair to Morrie to the plight of rural schools and back again. I would have liked smoother transitions between the various plots and themes. Sometimes the juxtapositions just felt too abrupt and jarring. Overall, The Whistling Season is a triumph of storytelling, a beautiful tale as charming as, say, a one-room schoolhouse in rural Montana.